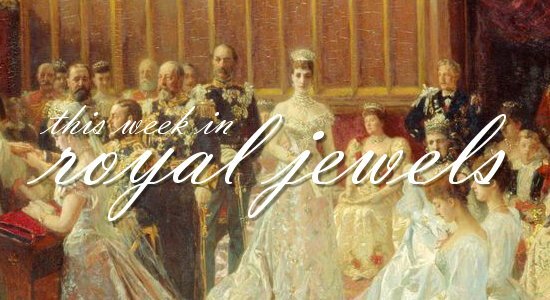 We've got another supersized royal jewel review for you this week! Don't forget to vote for your favorites in the poll below! 15. Queen Rania of Jordan wore multiple trendy earrings on Sunday as she arrived at Haneda Airport in Tokyo. 14. 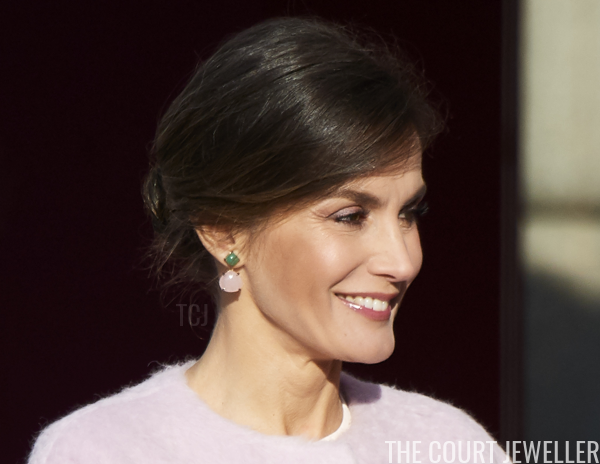 To view an exhibition on public service at the Royal Palace in Madrid on Thursday, Queen Letizia of Spain wore her trendy climber-style earrings. 13. 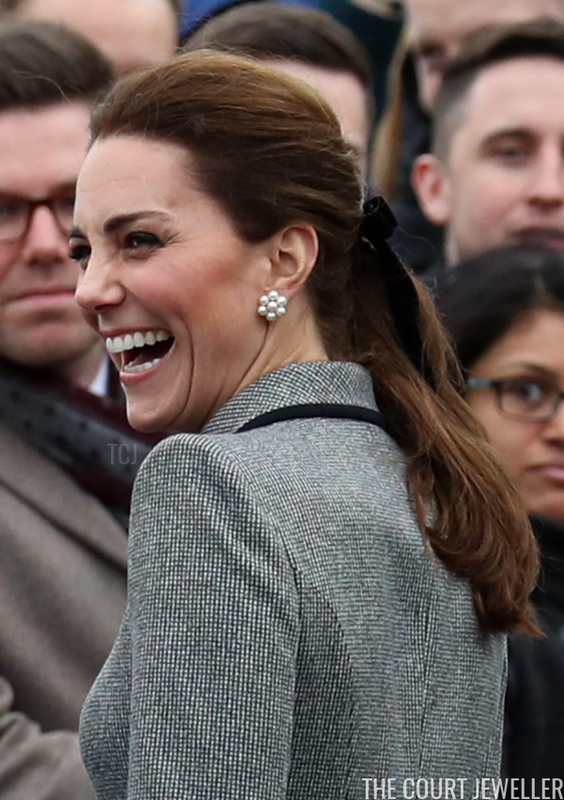 For Wednesday's visit to Leicester City Football Club’s King Power Stadium, the Duchess of Cambridge selected her pearl cluster stud earrings. 12. Diamond and pearl drop earrings were Princess Charlene of Monaco's accessory of choice as she attended the Abu Dhabi Formula One Grand Prix on Sunday. 11. Queen Letizia wore Coolook's Sarin earrings on Wednesday to receive the Chinese presidential couple at the Royal Palace in Madrid. 10. 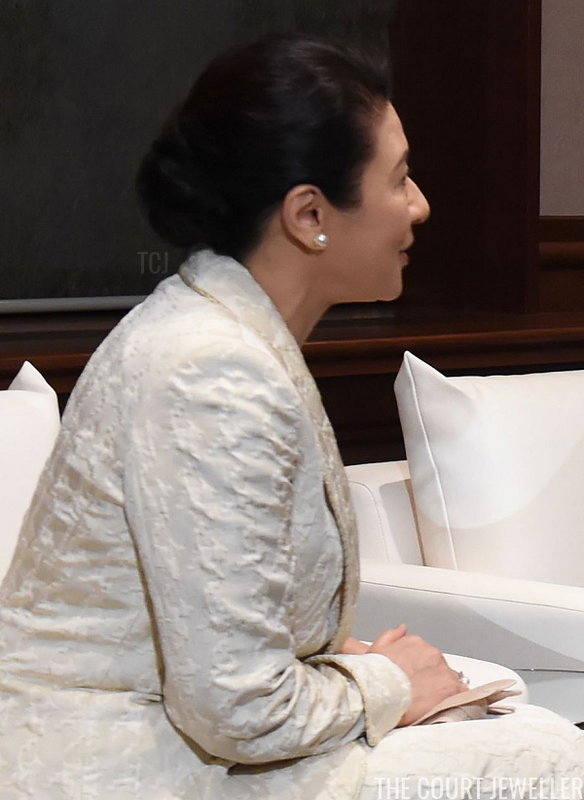 For a meeting with King Abdullah II and Queen Rania of Jordan in Tokyo on Monday, Crown Princess Masako of Japan wore classic pearl earrings. 9. Enormous statement earrings, and bracelets set with diamonds, rubies, and sapphires, were Queen Maxima of the Netherlands's accessories for the Erasmus Prize Award Ceremony on Tuesday in Amsterdam. 8. 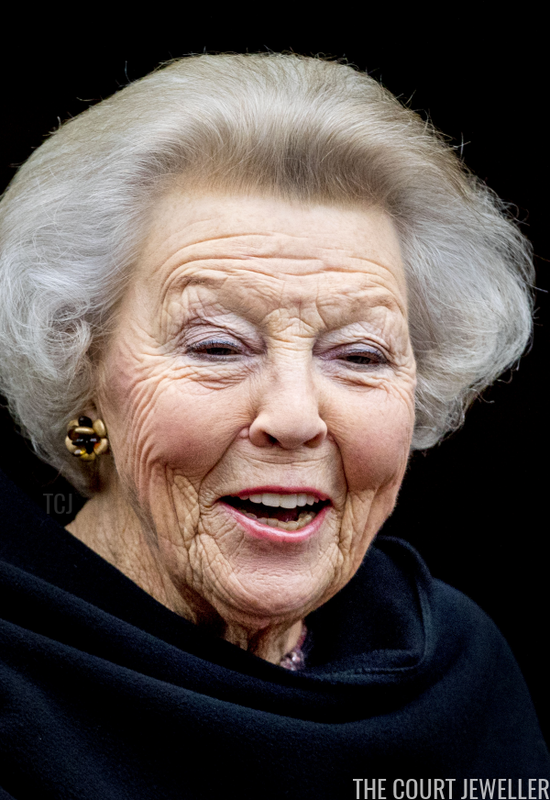 For Tuesday's Erasmus Prize Ceremony, Princess Beatrix of the Netherlands wore a pair of elaborate stud-style earrings. 7. 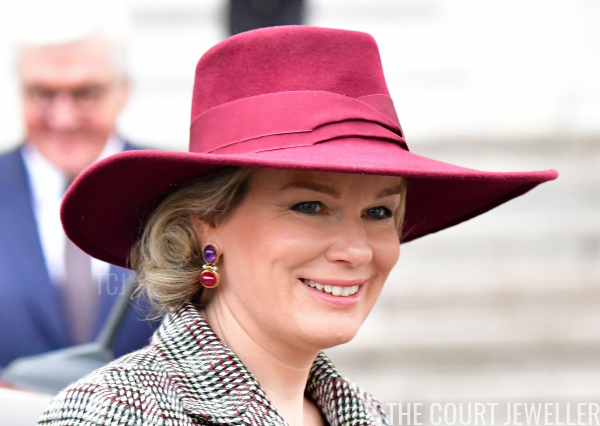 Queen Mathilde of the Belgians wore colorful statement earrings on Friday as she arrived at the Bellevue Palace in Berlin. 6. 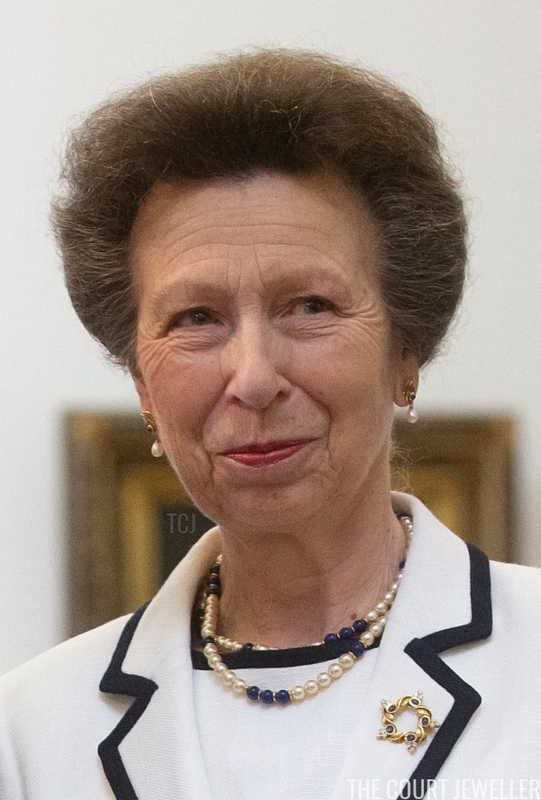 The Princess Royal brought along her suite of gold, diamond, and blue jewels as she helped celebrate the bicentennial of the Chilean Navy in Santiago on Wednesday. 5. 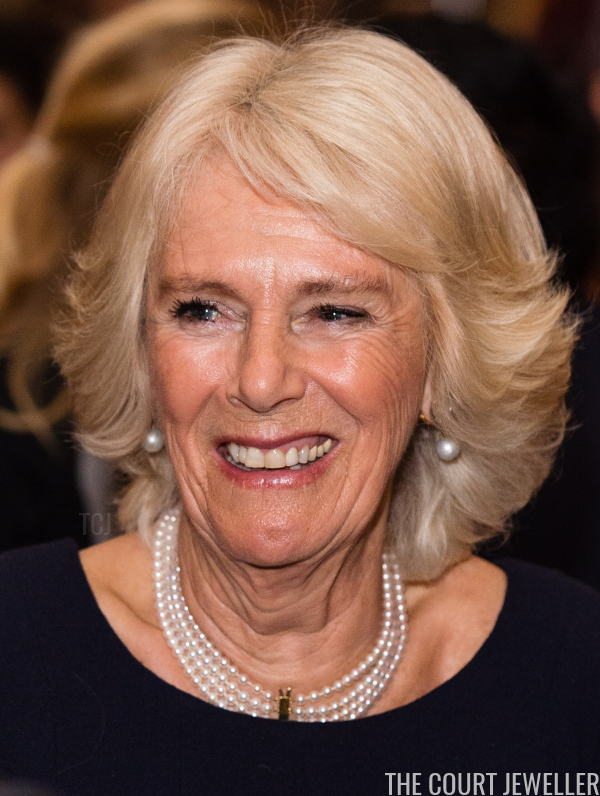 For a reception for winners of The Queen's Commonwealth Essay Competition at Buckingham Palace held last Thursday, the Duchess of Cornwall wore a four-stranded pearl choker necklace with a slim gold clasp. 4. 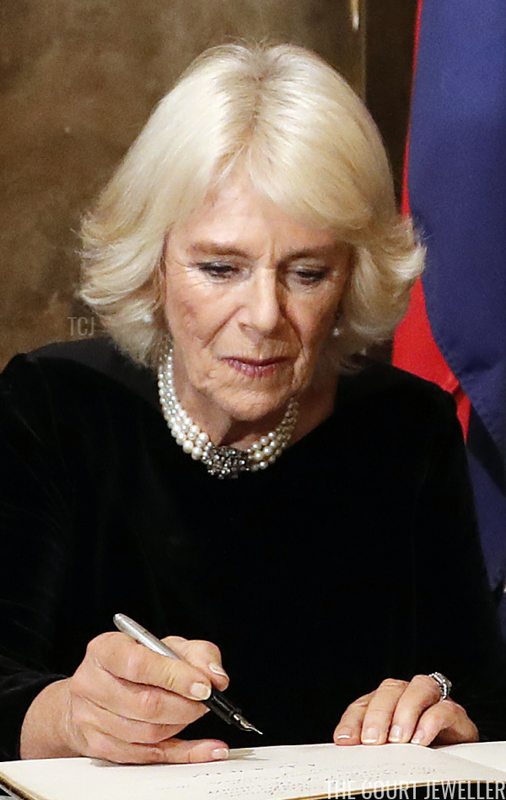 In London last Thursday, Camilla selected her pearl choker necklace with the large diamond clasp to sign the guest book at Australia House, which is celebrating its centenary. 3. 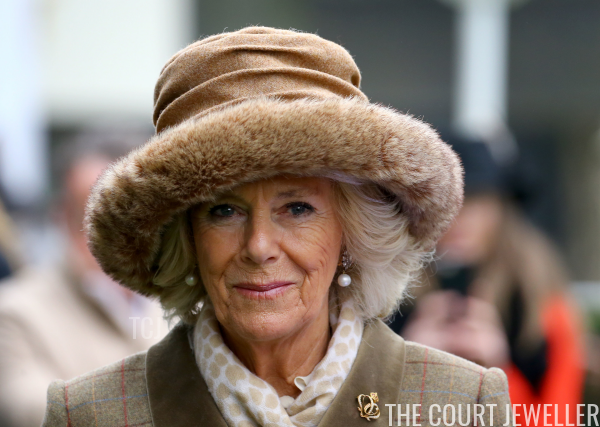 Favorite pearl drop earrings, and a lovely brooch featuring entwined Cs topped by a crown, were Camilla's chosen accessories for the Prince's Countryside Fund Raceday at Ascot Racecourse on Friday. 2. For an official dinner for the Chinese presidential couple at Zarzuela Palace on Tuesday, Queen Letizia wore her aquamarine and diamond earrings from Bulgari with one of the diamond bracelets from the joyas de pasar collection.